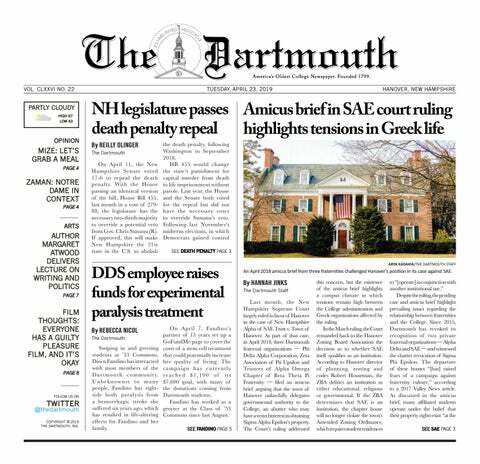 Students are always talking about why they chose to attend this school, but why did you choose Dartmouth? JI: I chose Dartmouth because it had the combination of a rigorous program in [undergraduate] and graduate populations, and also because of the observational resources that were available. I’m an observational astrophysicist, so it’s really important that I be able to actually observe the sky, and Dartmouth has a really competitive suite of instruments with which to do that. So for me, the combination of having folks that are going to be sharp and ready to do the work and the raw resources to do that same work made it a really strong combination. I’m also very interested in the notion of the teacher-scholar model. How did you become interested in the area of research you’re involved in, namely particle acceleration and blazars? JI: I am always curious about the universe — I think it’s one of the most interesting things that we exist in. I’ve always thought that black holes were really interesting, so when I found out in graduate school about these massive black holes that were somehow able to spin up these jets, which are really just accelerated particles, I just wanted to understand more about them. I couldn’t believe, really, that they existed or that you could study them directly. What tools do you use in your research? JI: I use directly imaged data from the environment around these blazars. I get the material from the South African Large Telescope, which is in South Africa and Dartmouth is a collaborator on, and I use the MDM Observatory, also partly owned by Dartmouth in Arizona. I also use data that comes from other observatories around the world and from other space-born observatories, like the Fermi Gamma-ray Space Telescope. You were Yale’s first African-American woman to earn a PhD in astrophysics. How did that experience shape you? JI: I will say quite honestly that when I started my Ph.D., I didn’t start to be the first of anything. I started because I thought space was cool. I think black holes are among the coolest things in the universe, so what I was doing was pursuing my dream and pursuing my interests as a scientist and researcher. As I moved through the process, it became clear that the fact that I was Yale’s first African-American woman to earn a Ph.D. in astrophysics was also true, both in the way that my experience was lived out and in the way that history was lived out in the institution. I think, ultimately, there were things that I learned that were super helpful, and I achieved the dream of learning about particle jets, and here I am getting to share with a grand research group and another generation of folks. Could you elaborate on how you connect to the idea of liminal space, which you spoke about in one of your TED talks? JI: In a STEM context, we bring rich histories and knowledges and senses of understanding into our pursuit of science; it’s not just numbers and equations to plug in, but the kinds of questions we ask, the things that we find interesting, the methods we go about solving any given equation, are informed by the tools we have in our tool set, which are broadly defined. The goal is to make sure while we’re educating about the principles of science, we’re also creating pathways and access and opportunities to education so everyone who wants to can be a part of it, and not creating barriers that might stop folks’ interest. In that talk, I was specifically highlighting women of color in STEM as a group who sits at a number of different crossroads and how that might be of benefit to the community. Why did you found VanguardSTEM? JI: I am a black woman in astrophysics, and I am honored to be in the category of women of color in STEM, and so I resonate with some of the shared experiences, the cultural touchpoints of the community. But also because there are things I wish I had and things that were being asked of me by students, even when I was a postdoc, that I wish existed. One example of that is mentoring and the sheer experience of being able to see the example or the representation of yourself in the work that you do. Ultimately, to be affirmed in that ... rather than being asked to be something else. I wanted to expand the definition of what it means to be a woman of color in STEM, specifically a black woman in astrophysics, and how to form community around this notion of both belonging and of agency and autonomy. What is one thing people should know about space, but don’t? JI: It’s kind of a thing that I like to point to, actually. Black holes are very much in the popular culture, people have some sense of what they are, but because they are part of pop culture there are some things that have trailed along that just aren’t true, and the one thing I just wish I could expunge from the record is that black holes are not vacuums in space. It’s the kind of thing that everyone assumes, but they are actually pretty picky eaters; you have to fall onto the accretion disc — or as I like to call it, the dinner plate — in precisely the right way in order to actually fall onto a black hole.